Earlier this morning, I came across the exciting find that the WIP system had been used to make its 20000th identification. It’s hard to express my amazement that a little bit of code I strung together in 2012 has managed to have such a global impact. The honors of 20K go to Canada, and there has recently been an increased use from countries in Western Africa. Here’s to 30K and an even brighter future. Congrats Jeanne + An Evening to Remember! Last night, I had the honor of attending the retirement celebration of Jeanne vonRentzell, an undoubtedly boisterous voice in the Micro world at Loyola. I didn’t talk about it last night because the event was already marked by the joyous train of speeches, but I do have a story to share. My dad and I would often talk about things going on in our labs. People were no exception, and there were always good tales regarding growth and the future — and how good a place the lab happened to be in. One of the moments that stands out to me when it comes to Jeanne was the trip to Boston. This was an incredibly hectic time in the Schreckenberger House. The week before, we had just gone to Minnesota so I could get a place to live. I bought a car, and I was officially moving in two weeks. Of course, in the middle of that two week span was the ASM meeting, and my dad wanted me to present ASHEX in his GNNFB session. That certainly brought about its own chain of pride, but the one thing that we was undeniably stoked about was Jeanne’s poster. Oh my gosh, he was unfathomably excited about this poster. He ate it up and was beyond happy when it came to the Masters push. That’s just the kind of guy he was, and how could you not sit there and eat it up? He was proud of everyone who worked with him, and that snapshot barely captures a fraction of how proud he was when you, Jeanne, presented that work. If you thought I couldn’t get sappier… the lab had a surprise for me last night as well. When the 1000th clinical isolate was entered into ASHEX, I knew there had to be a party. That lab is filled with party people. You don’t just hit a milestone. It worked out that the retirement party was at Giordano’s and that was also my first choice for a little get-together. Things converged. Celebrate! I guess I shouldn’t have been surprised at all that Roman and Kathy called me up and presented me with the certificate above. There isn’t a whole lot I can do to express the feels on that one. The WIPs are probably the best things I have created, even with all the physics stuff factored in. This system has helped people (a heck of a lot of people), and it would not have been possible to build without the work of the lab. It’s a great team accomplishment, and it’s not going anywhere as long as I’m around to maintain it. Hello everyone! I’ve made a minor tweak to the Vibrio WIP to bring it into alignment with ASHEX and Enterics WIPs. There is no calculation change, though doing this tweak allowed me to reduce the file size of the calculator considerably. If you’re getting weird results (like every result appears as 8.33%), please clear your browser cache and reload the page. The most substantial change to the form is that test results now auto-fill as negative instead of nothing. If there is feedback that this is a time-waster, I can change it back to N/A. ASHEX18XB WIP is now live! I come to you today with a special announcement. Thirteen years after my dad first approached me with the idea of building the ASHEX table, the 1000th Gram-negative, non-fermenting clinical isolate was recorded this past week. The additional biochemical results are stored in the brand new ASHEX18XB Web Identification Program, which has now replaced the link in the menu at the top of the page. The corresponding ASHEX18X matrix will be available for download shortly in the Non-Fermenter ID section of the site, and it represents everything my dad put into this field and more. When my father passed away in November, we had 932 isolates recorded in the table. After visiting his office, I found an additional 39 isolates with identifications he had checked and approved, which brought the total isolate count to 971 in the 17X version. There were additional mysteries uncovered. Two of his colleagues, Kathy McKinley and Joyce Tjhio had performed numerous tests on these organisms over the years, and a comprehensive comparison of biochemical, MALDI-TOF, and gene sequencing techniques had been carried out in the months prior to that November. But the stars seemed to align, and the rollout of 17X went on without a hitch. After speaking with my dad’s successor, Dr. Amanda Harrington, she reaffirmed an effort that had been a fantasy for me. We’d get the table to 1000 clinical isolates, and now we have. It is hard for me to put into words my feelings on this one. He should have been here for this, and he is not. But in a way, he has been here the whole time. When we were worried a 13-year-old sheet had been misplaced, Kathy would somehow find it on top of a stack in the lab. If I grew curious about a result, the answer seemed to be literally written out in his chapter of The Koneman. Every step carried a little bit of magic, and that bridge that this project forged between the worlds of physics and microbiology grew stronger with each question and answer. Today, ASHEX18XB is now live! The matrix represents 108 taxa with biochemical results from 1000 clinical isolates. Since the WIPs were launched in 2012, over 18500 identifications have been made with this free-to-use, open data system, and countless more identifications were made with the table in the eight years before that. A special thank you to those at UIC, Loyola, and elsewhere that touched Dr. S’s life. Dr. Adam P. Schreckenberger, Ph.D.
ASHEX18XB is in the works! New tutorial video. Greetings everyone, Adam here with an end-of-summer announcement. An updated version of the ASHEX identification matrix is in the works. 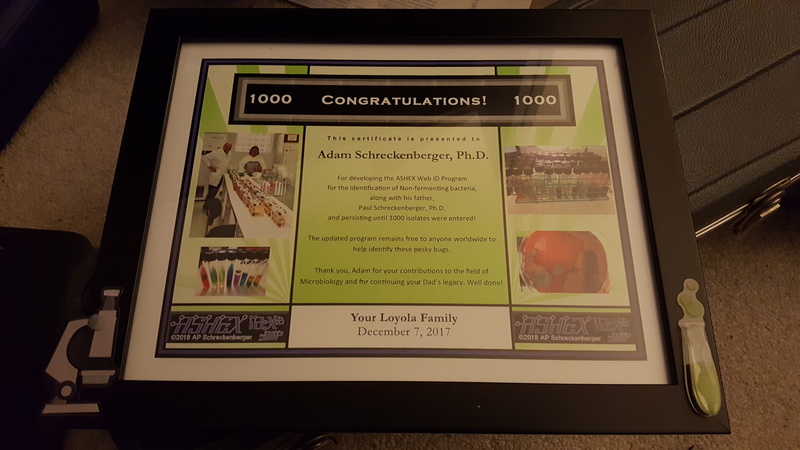 The folks at Loyola University Medical Center are helping me complete the push to 1000 clinical isolates, a mark that my dad and I always viewed as the pipe dream benchmark. During this work, I realized that I haven’t made a tutorial video since 2014, and the more I thought about it, the more I convinced myself that it was time for an update. As promised, another update to the WIP has been made. ASHEX17XB is now up and running. This version of the WIP represents 105 taxa using data from 971 clinical isolates. Again, the legacy version of ASHEX14X is still available. ASHEX17XB is carrying the development torch forward into the future. I attempted something new with this version of the WIP, and I am extremely happy to add to the functionality of the program. The details are covered more on the Non-Fermenter ID page. The basic gist is that users can now perform a check using a Wilson Binomial Matrix (WBM) instead. The WBM takes into account the sample sizes for each taxon, and there are some benefits to having this feature available. The standard setting is for the calculation to use the same method as the previous WIPs (what everyone is used to), and it’s worth repeating here that the WBM is not better. Having it available just gives us, as scientists, an option to explore potential cases where various ID systems disagree. ASHEX16X is now live! This update was built using a stack of biochemical test results my dad (Dr. Paul) had left for me to enter before his passing. Some of you might have also seen that there are now two ASHEX (GNNFB) links. I have decided to freeze ASHEX14X and keep it available. While I — and the great group at Loyola — are 110% committed to updating the ASHEX table to the highest caliber of standards, the caliber to which my father demanded, I realize there are some out there who might not be comfortable using tools built in the wake of his expertise. The WIP as it was at the time of his passing (ASHEX14X) will remain available, while the other link (ASHEX16X) will carry future developments. Right now, there are several updates in the works. I improved the appearance of the Enterics WIP form last night. I plan to do the same to the Vibrio WIP, as well. Like a good teacher, my dad left behind NFB sheets that pose interesting questions, and I aim to get that sorted with the help of his lab. In other words, the update to ASHEX16X is the first step in a two-step upgrade. ASHEX17X will follow shortly (likely early 2017). This is the reason why the raw 16X table file is not currently available for download like the 14X one is. I’m moving forward immediately. It is a Schreckenberger trait. Also, the typical note: ASHEX16X represents 104 taxa using data from 932 clinical isolates. Thanks for your energy and support! Greetings everyone, it is with great sorrow that I have to inform you that my father passed away suddenly on November 29th. He was the best dad anyone could ask for. 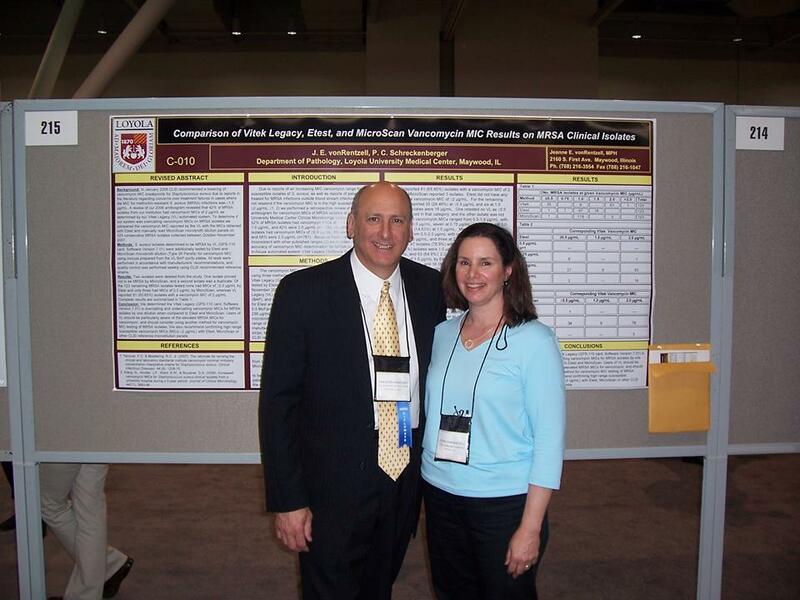 He was always supportive, knew what to say, and made a one-of-a-kind educator. There are no words that could possibly describe how much he’ll be missed by my family, his friends, his colleagues, and me. The phone calls, emails, texts, and videos have been overwhelming. It’s been especially touching for my mom. This site is part of his legacy. We built it as a team… his knowledge and experience… with the science I had learned through physics. This site and its resources are going nowhere. They will remain as a bastion for the ideals and methods for which he stood. It’s like a light has gone out. It’s like a light has dispersed, and we’re left trying to fill a void that cannot be filled. Though, we can do what he would want of us. Shine brighter. Shine brighter. Greetings and happy Monday folks! I have some big news to share this afternoon. Less than three years after the deployment of the Web-ID system, the AID-Cloud has recorded its 10,000th identification. This is a big milestone for us that I feel is worth sharing. When I began compiling my dad’s data back in 2004, I had no idea ASHEX would eventually touch 126 countries. If you had asked me back then that in 2012 I would have the coding experience to build a browser-based app, I would have probably laughed. If you had then told me that – within three years – the system would have been utilized for 10,000 identifications, I probably would have just grinned. I hope these tools continue to serve the Micro community – and that the goals established by a much-younger, past me continue to be met through the use of this software. Thanks for putting a little part of me in your lab space. Adam here with another update. This is long overdue! Today we rolled out ASHEX Version 14X. The new table is available for download in the Non-Fermenter tab. Also, the ASHEX WIP has already been updated to point at the 14X matrix. As of right now, I have not replaced the 12X image logo, but rest assured that the program is using the updated table. This update means we have expanded to 93 NFB species, represented by 887 clinical isolates. Content on this site belongs to Schreckenberger, P.C. & Schreckenberger, A.P. The ASHEX Non-Fermenter ID Matrix is (c) 2004-2015 Schreckenberger, A.P.